Have 1 seed vs. 16 seed games been getting closer in March Madness? Before the 2018 NCAA tournament, this was an easy story to write. The answer was no. Yeah, that plummet at the end would be courtesy of the Retrievers. The original idea to look at the tightness of 1-16 games in the NCAA tournament came from noticing a trend in our Bracket Challenge Game. 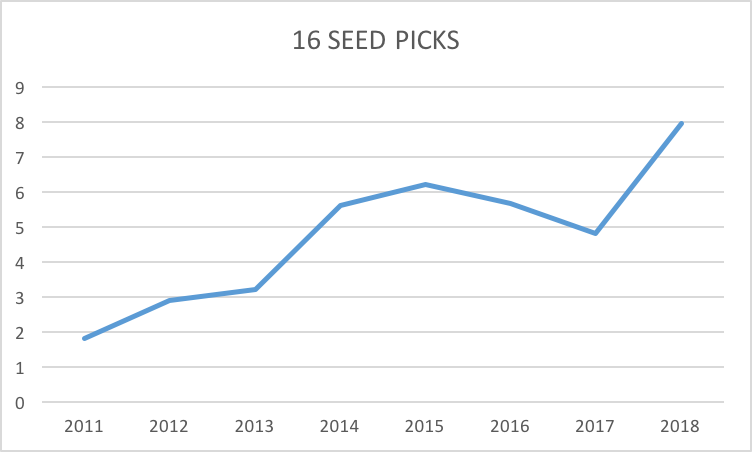 Over the past eight years, players have been picking 16 seeds to upset 1 seeds more and more, with a record 7.95 percent of brackets picking at least one 16-seed to win in the 2018 tournament. But only 2.18 percent of brackets picked UMBC over Virginia. They were right. Somehow. So, in the face of all this overwhelming negativity, why are people picking the ultimate underdogs more and more? Were the 2.18 percent who picked the Retrievers data geniuses? Or were they just lucky? We're going to go with lucky. At the least, the 2.18 percent didn't have a trend to pull from when looking at 16-1 games over history. There’s almost no pattern here at all. 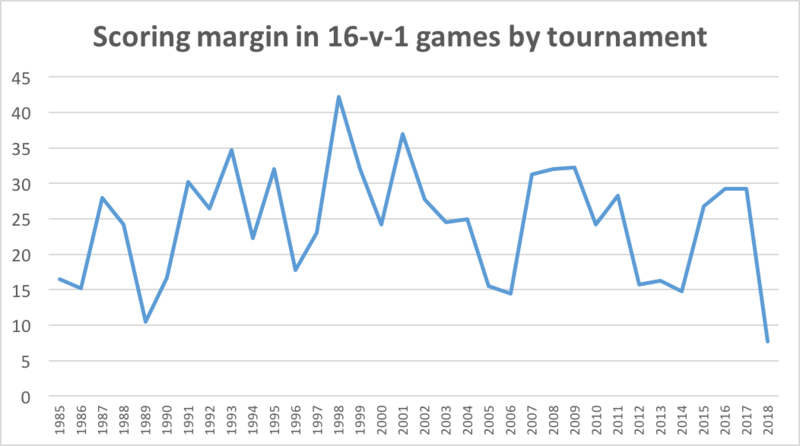 Even with UMBC's 20-point win, the average margin for the 136 1 vs. 16 games since 1985 (the first year the bracket included 16 seeds) is 24.36 points in favor of the 1 seeds. Yet users in our Bracket Challenge Game have gotten bolder over the years, with as many as 6.2 percent of all brackets picking a 16 seed to upset a 1 seed in 2015, and a record 7.95 percent going with the underdogs in 2018. We expect an even bigger jump in 2019, now that UMBC broke the glass ceiling. Only 15 games have been decided by fewer than 10 points, the most recent one in 2014: Arizona’s 68-59 win over Weber State. No game has been decided by one possession since 1996. That’s longer than most of the 2019 tournament’s players have been alive. In fact, in the past 11 years, more than three times as many 1 vs. 16 games have been decided by more than 30 points (13) than fewer than 10 points (four). The closest margin for any 1-16 game has been one point. It’s happened twice, and both games were in the 1989 tournament. The first was Georgetown’s 50-49 win over Princeton. The Hoyas would go on to lose to No. 2 Duke in the Elite Eight. The second game was Oklahoma’s 72-71 win over ETSU. In the very next round, the Sooners demolished No. 9 seed Louisiana Tech 124-81 (43 points! ), before losing to 5-seed Virginia in the Sweet 16. On the other side of the coin, the biggest blowout in the matchup's history was in 1998, when Kansas bullied Prairie View for a 110-52 win. That 58-point margin remains the largest in any tournament game since the tournament expanded in 1985, but Kansas would lose the next game to No. 8 seed Rhode Island 80-75. The closest any one tournament has been for 1-16 games was 2018, naturally. With the help of UMBC's 20-point win, the 1 seeds' margin of victory was just 7.5 points. In 1989, when those two games were decided by one point, the margin of victory for the 1 seed was 10.5 points over the four games — the second lowest margin ever. The year of the biggest blowouts took place nine years later in 1998, when the average margin was 42.25 points thanks to wins of 88-52, 99-60, 99-63 and 110-52. The highest scoring matchup took place in 1987, UNC’s 113-82 win over Penn. The lowest score in a 1 vs. 16 game is 99 points, which has happened twice — Georgetown’s 50-49 win over Princeton in 1989, and UCLA’s 70-29 win over Mississippi Valley State in 2008. Slightly different games there.